Gin is the perfect drink any time of the year, we know this, summer in the sun, winter in front of a roaring fire but since autumn is fast upon us, and given that we love anything food related on xameliax, throw in some cosy vibes and we are there! That’s why we thought we would bring you some delicious, creative and most importantly, super easy gin inspired recipes to nail this autumn. Friday night in? Sunday afternoon/? These recipes will see you through until Christmas! Step 1: Throw the biscuits into a processor and blitz until all broken up, then melt the butter (microwave or on the stove in fine). Then add the butter to the biscuits and combine. If you want to do this the old-fashioned way, elbow grease works just as well as a processor. Step 2. Press the biscuit mixture into a cake tin. Press the mixture down until it creates a semi-flat surface and is packed in tightly. Then pop it in the fridge while you make the mixture. Step 3. Next up, place a bowl of the white chocolate over the top of a simmering pan of water. Ensure the bowl and the water don’t make contact but you let the gently simmering water melt the chocolate. Then let it cool. Step 4. Mix the cream cheese in a bowl until it’s soft and malleable. Then grate in the zest of 1 lime and combine. Then add in the cooled white chocolate mixture. Step 5. Back to the elbow grease, whip the cream and add in the gin. Step 6. Mix the cream cheese and the gin and cream mixture together and then pile on top of the biscuit base. Pop it in the fridge for at least 4 hours (preferably overnight) then eat- The best bit! Step 1. Easy peasy- Preheat the oven to 180c. Step 2. Place the blackberries in a saucepan with the water and sugar. Let the mixture come to the boil and then turn the heat down to medium as the bubbles form. Add in the gin and bring off the heat to cool. Step 3. Unwrap your Camembert then place it back in the box it comes in. The cut the top layer of wax off and bury a little garlic and thyme into the cheese. This will infuse and give amazing flavour. Step 4. In a separate dish, squeeze your honey and stir in the gin. Step 5. 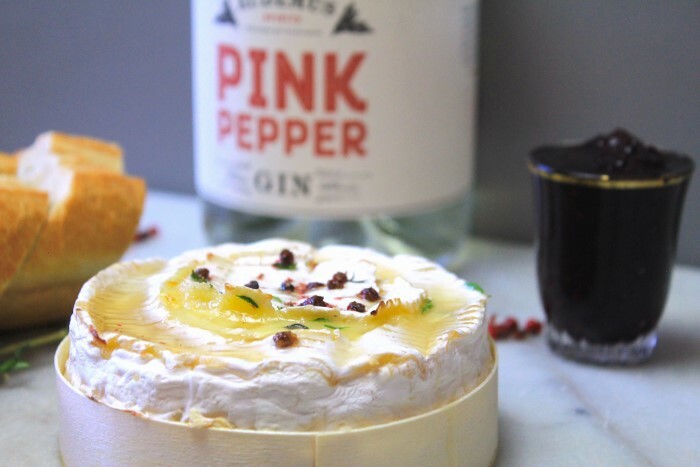 Take the gin and honey mixture and pour into the camembert. Place the lid back on then add a little more gin and honey, a few time leaves and some crushed pepper. Step 6. Pop the cheese into the oven until deliciously gooey and soft. Step 7. Serve with the cooled blackberry jam and some super fresh french bread for dipping. Divine! Step 1. Start off my places the marshmallows, chocolate, water and butter into a bowl over a pan of simmering water. Step 2. While stirring occasionally, allow everything to melt together then remove from the heat. Step 3. In another bowl, whip the cream vigorously and add in the gin. One the chocolate and marshmallow mixture has cooled, combine with the cream. Step 4. Pour into little cups, glasses or ramekins. Add orange peel and then scoop of ice-cream into a glass or old jam jar. 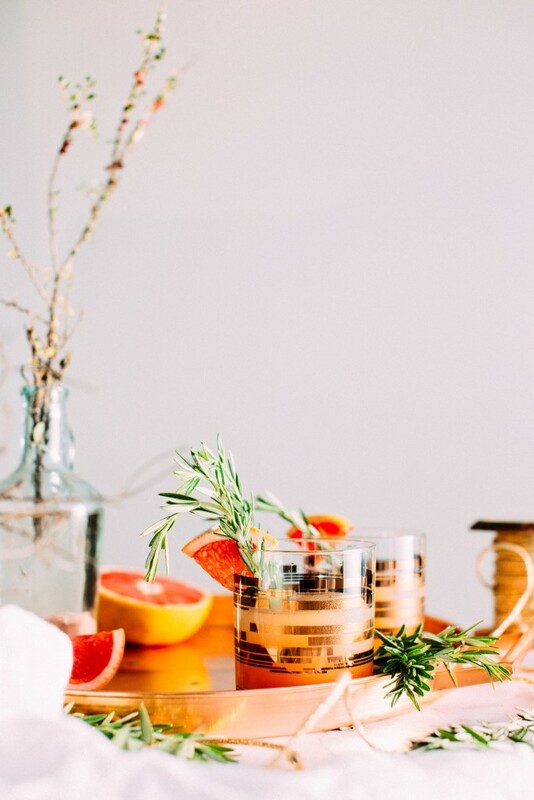 Garnish with a slice of orange and enjoy through your reusable straw! Step 1. Add the flour, ground almonds, sugar and baking powder to a bowl. Step 2. Next up, add half the grapefruit juice and zest followed by the olive oil, almond milk, and vanilla extract (if using). Step 3. Combine until a smooth lump free batter and place into the lined tin. Bake for 45 minutes at 180 degrees- you can check with the classic technique of places a clean knife inside. If it comes out clean its cooked! Step 4. Meanwhile to make the syrup add the other half of the grapefruit juice (saving 2 tsp for the icing) and 5 tbsp of sugar in a saucepan. When it starts to thicken take it off the heat and stir in your gin! Step 5. Once the cake has cooled a little, prick the cake with a force or a skewer. Step 6. Pour the gin infused syrup over the cake and let it seep in! It seems as if the Autumn won’t be so bad after all. What do the Danes call it?- That sense of content-ness mixed with warm and fuzzy vibes? Hygge? Yup that’s it, we want gin infused Hygge. Hope you love creating and experimenting with these recipes, feel free to add your own twist and if you do, let us know how it goes, send us images and messages on the socials or in the comments below. This article was written with our friends at ILoveGin.com subscribe and get a box of hand-selected gins to your house every month. Sample new and exciting gins from around the world and create your very own gin concoctions!